Bridgman IBC take the problems out of door specification. Simply let us know your requirements, and we are able to manufacture to order. That means a door delivered in your choice of facing – veneer, laminate or primed for internal painting, with a certified fire rating, factory glazed to your design, and prepared for your lock fitting if required. Technical staff are on hand to provide expert specification advice concerning materials and component selection together with design and technical support to ensure your doors are co-ordinated with your project. Click here to download the Fire Doors brochure as a PDF file. Reduced on-site costs – Selecting Bridgman IBC Doors not only saves on-site joinery time and labour costs, it also means faster, easier installation because we manufacture to correct tolerances. Quality assurance – Our doors meet all relevant British Standards and offer guaranteed performance. All timbers are to BS 1186 class 1 & 2 with factory controlled moisture content. Full fire certification – We supply doors with full fire certification up to FD60 to meet the latest British Standards. FD30 and FD60 assessment packages are available to assist you at the design stage. Environmentally aware – All materials used in the manufacture of our products are from sustainable sources. 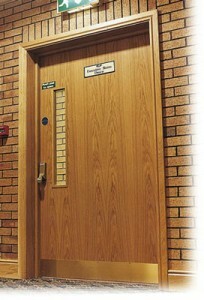 Proven capability across all sectors – Bridgman IBC has a successful track record in the design and manufacture of special doors and fire doors for clients in all commercial sectors, such as: hospitals, health & pharmaceutical industries, retail, offices, schools, hotels, airports, sports stadia and other public buildings. Detailed case histories are available on request. High quality doorset packages – For further cost reduction and interior design integrity,. we also manufacture complete doorsets. Free technical support and site visits – Technical staff are assigned to each project to provide in depth design and specification advice to architects, surveyors and contractors. This ensures costs are minimised and delivery schedules are met.